I don’t want to dwell too much on this, primarily because it’s not nice to lose, but also because I personally think Redknapp made the correct decision with his team selection (loosely correct anyway – I wasn’t a fan of the initial 4-3-3 formation), and I am not too worried about being out of the League Cup. 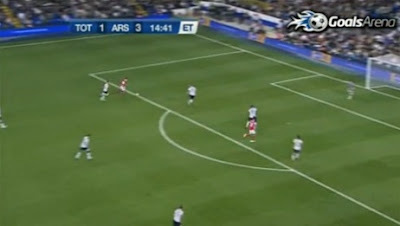 This is an excellent move from Arsenal, but it’s yet another defensive switch-off from Spurs, which is very frustrating. Eboue picks out Gibbs with a cross-field pass, and Gibbs cuts inside. Spurs seem fairly well set to defend. Gibbs shifts the ball outside to Nasri, who has plenty of room to operate. Notice Bentley – doing a good job of tracking Lansbury – and also Assou-Ekotto, who is central. Nasri is overlapped by Wilshere, and plays him in. 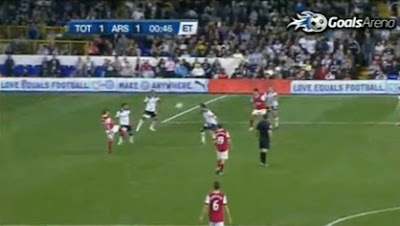 As Wilshere crosses, Lansbury is clearly onside, although is now ahead of Bentley, who has inexplicably stopped running! Also note Assou-Ekotto, totally unaware of Lansbury’s run. 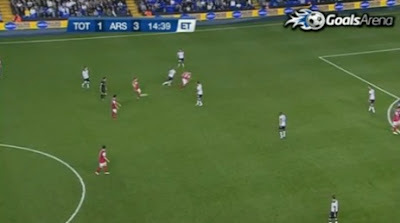 Great ball by Wilshere, and Lansbury is left with the simple task of tapping home, thanks to Bentley and Assou-Ekotto leaving him totally unmarked. Arshavin lifts the ball into the box, where Caulker has Chamakh, and Bassong has Nasri. Bassong has got too tight to Nasri, who turns him cleverly. However, I can’t work out what the penalty is given for – there is certainly a very slight contact with Bassong’s chest on Nasri’s back, but I think it may have been given for the above. It’s very difficult to see whether Bassong makes contact with Nasri’s back leg (left hanging in the hope of contact). Regardless, Nasri is quick to go to ground – a soft decision. Nasri he steps up and sends Pletikosa the wrong way. A flowing move by Arsenal, who are full of confidence, and against a team who suddenly look shell-shocked. Caulker, who had a promising debut, is very naive here – you don’t give Premier League players any reason to hit the deck, and that’s just what he does. This time, the referee gets it right – a clear tug on Chamakh. Nasri sends Pletikosa the wrong way again. Yet another very frustrating goal to concede. Naughton gives away a foul, and just goes to sleep. 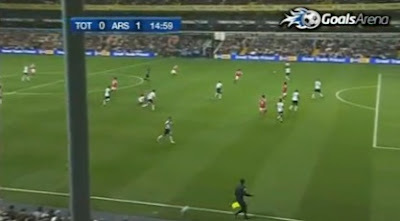 Arshavin makes a run off him, and is found by Wilshere. He makes his way into the penalty area and, despite not having much to aim at, he is confident, and strikes across Pletikosa. Very crisp finish, and I don’t think Pletikosa can take any criticism. To be honest, I am an Arsenal fan! But I totally agree with what you have written, it wasn't biased at all and even I think that Nasri did fall down a bit softly, but that is just the thing with football nowadays! I'm sure all Tottenham fans agree that Keane was offside but things go your way and things don't, so I think that all round it was equal although it was annoying when Gibbs was a yard onside in the first half! Hi Raihaan - thanks for your comment. 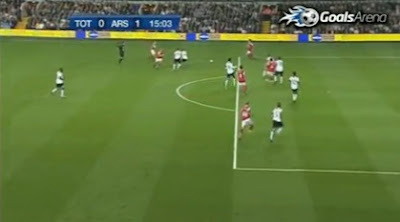 Agree about the Gibbs and Keane offside decisions - we got lucky with both. I thought Arsenal deserved to win, but I thought 1-4 was a bit flattering. It was an exciting game for what was essentially a reserve match! You should do this for more games...not just Tottenham games cause I won't be reading it haha. But your analysis is spot on. I would wish you luck for the future, but you and I both know I won't mean it! I think you're wrong about the first penalty. It looks to me as if Bassong's right foot clipped Nasri's left ankle. A small contact, but with Nasri pushing off hard from his left foot to try and reach the through ball (not 'trailing his leg' as you suggest) it was guaranteed to bring him down. None of the camera angles is 100% conclusive, but the way Nasri fell seems (to me at least) to be totally consistent with a small trip. Ditto about the analysis. And let's not forget that for all our supposed dominance, it was 1-1 after 90min. Reminds me of the 1st leg of the CC semi in 08 when Spurs dominated at the Grove, but Theo somehow managed a fluky equalizer. No telling what the score would have been that day if there was extra time. Also am I the only one getting tired of fans conveniently not caring about the CC after a defeat? 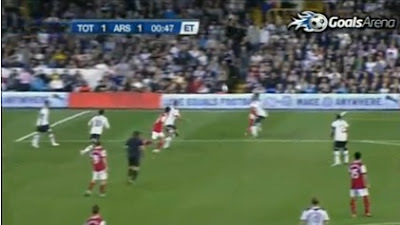 I don't believe any gooner who claims he didn't care when we got spanked at the lane 3 years ago. And the spurs fans I saw celebrating Keane's equalizer could hardly be described as indifferent. Surely any true supporter cares when his team loses in any competition, especially at home. No point pretending not to. The first penalty is a penalty, you don't purposely leave your trailing behind, because that is how everybody run. On Nasri...yes there was no clattering tackle but in addition to the contact with the leg Bassong had a wee bit of Nasri's shirt in his right hand (not visible in your photo but shown in the replays I've seen). Lastly...to those who complain about "slight" contact with a player's foot or leg resulting in them hitting the deck. Have you run at full tilt since you were a school boy? Try it this weekend and have someone "slightly" clip your heel. My guess is you'll go *ss over tipple cart and end up on the floor. I think you're mixing multiple issues here. There's a difference between the club not prioritizing the the CC and the supporters not caring about being knocked out. I'm not denying that, gate revenue aside, neither of our clubs would be losing sleep over this competition. What I do take issue with is fans claiming not to care. There's no shame in wanting your team to win and being disappointed when they don't, regardless of the competition. It's almost as if fans of the bigger clubs see it as a sign of weakness to admit this. Totally agree with anon @ 23:10... if you're haring along at great speed then any contact can send you flying, so I guess the only people who know *for sure* if it was a deserved pen are the two players involved. Having said that, you see things like that not given plenty of times too so what can you do. Good analysis of the game btw Windy. Hi; I'm an Arsenal fan but I don't hate the Spurs. You guys play good entertaining football, so your OK in my book. I also am not 100% sure of what brought Nasri down, but our players get knocked about with religous fervor by other teams much to the delight of pundits and most refs. So Nasri probably thought"What the heck next time if there is any skin to skin contact with me I will milk it for what it's worth". Nice post overall. Your analysis was spot on. Do agree that Nasri wen down a bit easy. It was harsh. But I am an Arsenal fan so might have enjoyed it when the game was on. But we should leave these things behind, these happen. I hope see such post in future from you. Don't think Pletikosa can be blamed but he seems to be very much on a par with Cudocini: makes the routine saves well,the odd flap, but doesn't show the ability of Gomes to make those matchwinning saves that get you out of trouble. Not fair to judge on one perfomance obviously but he doesn't live up to his You tube billing. Agree with most of what youhave written - analysis spot on as usual. Main problem for me was not the players picked .....you shouldn't second guess yourself as a coach.....but the way Harry lined them up. I'd have gone with a straight out 4 5 1 switching Bentley wide right and Gio wide left. While finding the selection of three non-passers strange he should have given them a more deined role having chosen them in the middle. Sandro in front of thedefence with Palacios and Livermore getting and putting on pressure early before the arsenal passing got going.